While hot-rodders may drool over the high-powered Fusion Sport, we think the the 2017 Ford Fusion SE represents the best value for money at about $30,000. With its Aston Martin-esque styling, the 2017 Ford Fusion mid-size sedan remains a comfortable, spacious, and good-looking entry in an especially competitive segment. 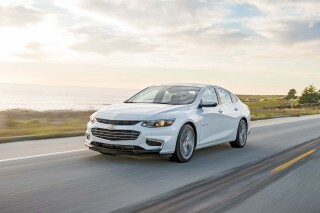 It competes with the Honda Accord, Hyundai Sonata, Toyota Camry, and a new and much improved Chevrolet Malibu. We named it our Best Car to Buy in 2013 and it continues to earn high ratings, aging pretty gracefully. This year, the Fusion gets a light refresh that includes mildly updated styling front and rear, some upgrades to the interior, a new Platinum top-end trim level, and a new performance model called the Fusion Sport. The profile, stance, and details of the Fusion continue to make it one of the more attractive cars among mid-size sedans. The fastback shape looks especially dashing in darker colors. This year, the grille is slightly wider and sleeker, and new LED headlamps join the LED taillights. A new chrome strip at the rear adds “elegant imagery,” and there are new wheel designs as well. For 2017, the Fusion adds a fifth powertrain option, a new twin-turbo 2.7-liter V-6 in the Fusion Sport model that puts out 325-horsepower and 380 pound-feet of torque. 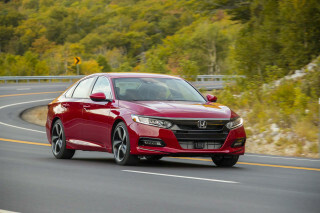 It comes standard with all-wheel drive, and is considerably more powerful than larger V-6 engines in the Accord and Camry. It gets continuously controlled damping that detects potholes and adjusts the damping to reduce their impact. The Fusion Sport is quite fast in a straight line, but it adds a lot of weight over the nose so it doesn't handle like a full-blown sport sedan. 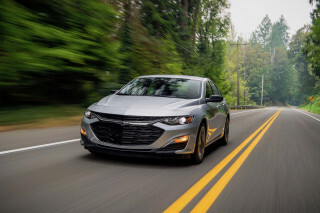 The base powertrain remains a 178-hp, 2.5-liter 4-cylinder and 6-speed automatic, with only adequate performance that doesn’t live up to the rakish design. Then there’s a 1.5-liter EcoBoost turbo-4 coupled to the same automatic transmission; offering a more rewarding drive that can deliver great real-world gas mileage. The 1.5-liter engine comes with stop-start system as standard. The previous top-of-the-line engine was the 240-hp 2.0-liter EcoBoost turbo inline-4, which puts 270 lb-ft of torque and substituted well for the V-6 of similar output that it supplanted. This is the engine you’ll get if you want the Fusion with optional all-wheel drive (unless you go for the hot-rod Fusion Sport, on which it’s standard). Finally, the fuel-efficient (but still responsive) Fusion Hybrid and its plug-in sibling, the Fusion Energi both earn ratings of more than 40 mpg combined from the EPA. They’re covered in a separate review. The ride and handling of the Fusion is top-notch for the class. The taut, absorbent steering is well-tuned, and the car corners in a firm, flat, and reassuring manner. But ride quality isn’t hurt by the handling, and most versions feel eager and nimble—unlike many mid-size sedan competitors. Fusion comfort, safety, and features. Inside the Fusion, the interior conveys an impression of quality. The materials look and feel substantial, the noise is well damped and vibrations are suppressed, and subtle cues like the sound and feel of the doors as they open and close combine to indicate a solid, well-built, and high-quality vehicle. Changes this year include a redesigned console with a rotary gear-selector knob, freeing up space for more storage, and Ford says the cupholders are more ergonomically place. Repositioned USB ports are now illuminated as well, and the 2017 Fusion is fitted with the latest Sync 3 version of Ford’s interactive infotainment system. Even the manually adjusted front seats in the base model are comfortable and supportive, and rear leg room is sufficient for four adults to ride comfortably, or five in a pinch. Head room is good as long as you avoid the sunroof, which cuts significantly into vertical space, especially in the rear. And Ford has provided ample and useful storage space in the doors and center console. Previous models of the Fusion have received good, but not quite top-tier, ratings from safety agencies. For 2017, Ford has added a slew of new electronic safety systems, bringing the Fusion up to par with its most advanced competitors. These include adaptive cruise control that works down to a full stop and back up to speed; pre-collision assist with pedestrian detection; a lane-keeping system; driver alerts for drowsiness; and an enhanced Park Assist that now includes perpendicular as well as parallel parking. It continues to offer the innovative inflatable rear seatbelt system that's been offered on some of Ford's crossovers. The Platinum trim gets hand-wrapped leather for its steering wheel, instrument panel, and door trim. It has its own grille, as well as special 19-inch alloy wheels. The new Fusion Sport gets some unique styling to set it apart from more pedestrian Fusions. These include its own 19-inch wheels, steering wheel shift paddles, LED fog lamps, a rear spoiler, aluminum pedals, leather and synthetic suede sport seats, and active noise cancellation. Fusion prices for 2017 start at around $23,000 for the base S trim level, and move up through a top end of roughly $42,000 for the Fusion Energi plug-in hybrid in the new Platinum trim level. A heavy hand on the options list can push even a mid-level model well into the $30,000-plus range, if you add items like the moonroof, navigation, upgraded wheels, and the expanded range of new safety-tech items. Other options of note include an Appearance Package to dress up the base Fusion S model with 18-inch alloy painted Ebony black wheels, fog lamps, and a rear spoiler, and a Cold Weather package for the SE that bundles remote starting, heated cloth seats, and floor mats. The best value is probably the Fusion SE, which offers a reasonably well-equipped model for about $30,000. The 2017 Ford Fusion is slightly updated but remains graceful, sporty, and one of the standouts in its segment. This generation of the Fusion has been on the market since the 2013 model year. It has always been one of the most stylish, head-turning models in the class, and this year it gets some design tweaks inside and out. With those changes, the 2017 Fusion remains one of the most attractive mid-size sedans, and that holds true whether talking about overarching design themes, styling, or up-close design details. The most important changes are on the inside, and they are mostly functional. The center console has been redesigned around a new rotary shift dial, adding a media hub, a cell phone storage pocket, a larger console bin, and a longer center armrest. The overall look is sleek and somewhat premium. We like how it takes a step away from the super-angular, more pinched look of the Focus and Fiesta interiors, instead framing the center stack of controls in a simple metallic ring that leaves a strong graphic imprint on the cabin. It's a striking effect, with obvious influences from Volvo, including the storage bin under the climate controls, open at the sides. The 2017 exterior changes involve tweaks to the grille, front fascia, and taillights, as well as the addition of a chrome strip at the rear. The hexagonal Aston Martin-inspired grille is wider and slightly more angular. The headlights are more shapely, the lower front fascia is more open, the taillights are now bisected by that chrome strip, and both ends now feature LEDs. The Fusion Sport is further differentiated by its more aggressive front bumper with deeper air intakes and glossy black grille insert. From the nose on, to use the word "bold" here is no exaggeration, highlighted by that attractive grille. The gently arched roofline looks a bit like that of the Audi A7 from the rear angles, and its LED taillights help punctuate that. Yet from the side view, it's all Ford, with the details somehow adding up to a greater sense of the composite's identity. The 2017 Ford Fusion has taut handling and a purposefully firm ride--and a new V-6 option. 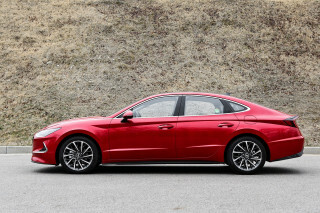 The Ford Fusion is among the best-driving of the mid-size sedans, along with the Mazda 6, some versions of the Honda Accord, and the new Chevrolet Malibu. 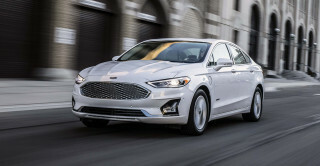 Ford has clearly tapped into its European-market expertise in giving the Fusion a very sophisticated set of ride-and-handling attributes, and the fine turbocharged 4-cylinder engines bring responsive acceleration with respectable fuel economy. While the engine lineup is generally strong, the base-level engine in the Fusion is a 178-horsepower, 2.5-liter 4-cylinder, and it doesn't come close to performing as well as the rakish design suggests. It does well enough with the 6-speed automatic, but it has to downshift often as it doesn't make its peak torque until a relatively high 4,500 rpm. A 181-horsepower, 1.5-liter turbo-4 is probably the best performance vs. price compromise for most buyers. Unlike its 1.6-liter predecessor, It's not available with a manual, but it has the mid-range pull to compensate for its very small displacement. You'll only occasionally be reminded that it's about half the displacement of what used to pass in mid-size cars. To get V-6-level performance in the Fusion, go straight for the 2.0-liter turbo-4. With its 240 hp and 270 lb-ft of torque, it's quick to rev, and the automatic's shifts click quickly via paddle controls. It's also remarkably vibration-free and quiet. Ford is also adding a twin-turbocharged 2.7-liter V-6 this year. It makes 325 hp and 380 lb-ft of torque. Standard all-wheel drive means the Fusion Sport can send all that torque to four wheels to avoid torque steer. It accelerates hard, but doesn't pin you back in your seat. Our unofficial tests indicate a 0-to-60 mph time of about 6.2 seconds, which is quite quick for a family sedan, but not as fast as we expected. Still, it sounds great and has no problem with passing or getting out ahead of traffic. The Fusion feels light behind the wheel, with well-tuned steering and a taut, yet absorbent ride. It corners in a flat, reassuring way that actually isn't to the detriment of ride quality; and overall, there's a nimble, eager feeling that's missing from most mid-size sedans. With its front struts and rear multi-link suspension, the Fusion is firm and composed, and never forgets that it's a family sedan first. It's definitely not stiff for stiff's sake, and there's more compliance here than in some rivals, yet not as much as the Altima. Ford boasts that the rear suspension, which it calls Control Link, is a premium setup that offers more isolation and better control than you'll find in rivals. Our seat-of-the-pants feel seems to confirm Ford's claims. Steering in the Fusion isn't perfect, but it's consistent in force and feel. There's not much feedback when unwinding the wheel, and the ratio could be quicker, but it feels sportier than what you're going to find in most other affordable mid-size sedans. Keep in mind, however, that the base 16-inch and optional 19-inch wheels at the bottom and top of the lineup will likely compromise handling and ride, respectively. That isn't the case with the Fusion Sport and its standard 19s because its adaptive dampers do a good job of smoothing out the ride, even in the Sport mode. The V-6 and its related turbochargers and intercoolers, however, add quite a bit of weight over the front wheels, and that means the Sport tends to push forward rather than rotate during aggressive cornering. It's not a sport sedan, but it is a fast family sedan that sounds great. The 2017 Ford Fusion has good front seats and cargo space, while the rear seat and some interior trim are now just average. From a comfort and usability standpoint, the 2017 Ford Fusion checks all the boxes, and there are no deal-breakers inside. And despite that somewhat curvaceous exterior appearance, it has one of the more spacious interiors in its class. The Fusion is a big sedan, at nearly 192 inches long and riding on a 112.2-inch wheelbase, but it's essentially in the middle of the "new norm" for U.S. mid-size sedans. Its interior volume of 118.8 cubic feet is just a cube or so shy of the EPA's full-size hurdle; trunk space of 16 cubic feet is good, too. Against any of the competition, the Fusion does a great job balancing between front and rear seat space, thanks in part to thin front seats. Comfort is great in both the power and manual seats, though the manual seats have a little too much front-end tilt to the bottom cushion for our tastes. Despite the curvy profile, tall doors make entry and exit easy, as do rather high seat cushions. In back, as with the Nissan Altima and VW Passat, 6-footers will make contact with the headliner, though if you omit the sunroof you should be okay. Fusion Sport buyers choose any interior color they want as long as it is Dark Earth Gray. They also get leather and synthetic suede front sport seats, a black headliner, carbon trim on the dash, aluminum pedals, and a steering wheel wrapped in a soft leather. Active noise cancellation comes standard. 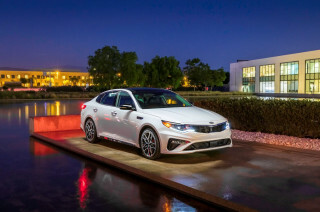 ; in the Sport mode, it lets in more of the 2.7-liter V-6's meaner, more sonorous sounds. The sport seats are slightly firmer, but they don't have much, if any more bolstering. Ford redesigns the Fusion's interior storage spaces this year, enabled mostly by a new rotary gearshift dial that takes up less space than the former lever. There is a new media hub at the base of the center stack with a lighted USB port that can be seen at night. In front of that is a vertical slot to store cell phones. The center console is bigger and its padded cover is longer to provide better support for passenger elbows. In all these changes make for better small items storage. With the exception of the scratch-prone piano black trim, the Fusion's panels and materials feel well fitted and well chosen. The base cloth upholstery is comfortable but definitely has an inexpensive look, relieved only by the leather option. Virtually all of surfaces higher up, in the zone where you might touch, are soft, and switchgear operates with precision. Even the doors open and close with a satisfying vibration-free thump. The new Platinum model has luxury level appointments. It features quilted leather on the seats and door panels, premium Venetian leather on the steering wheel, and leather on the instrument panel, center console, and door armrests. The 2017 Ford Fusion earns some very good crash-test scores, and has some very advanced safety features—on some models. All Fusion models include active headrests and a rearview camera. Rear parking sensors are an option on the SE and Sport and standard on the Titanium and Platinum. An innovative inflatable rear seat belt system is optional. In the Titanium, SE, and Sport models model you can add a package to get lane-departure warning and an active lane control system that nudges the car gently back on track if its forward-facing camera detects that it's crossed the lane divider; adaptive cruise control with forward collision warning; blind-spot monitors for the side rearview mirrors, with cross-traffic alerts that make backing out of parking spots a little safer; and active park assist, which dials the car into a parallel spot while you operate the pedals. The adaptive cruise adds stop-and-go capability this year, and the active park assist adds the ability to park itself in perpendicular spots. Newly available this year are forward collision warning with brake support, pre-collision assist with pedestrian detection, and driver alerts for drowsiness. Crash tests for the 2017 model are mixed. The IIHS gives the Fusion top marks all around, when equipped with automatic emergency braking, and calls it a Top Safety Pick. Its headlights do not merit the Top Safety Pick+, though. The federal government, meanwhile, gives the Fusion five stars overall but only four stars for the frontal collision test. Thanks to relatively slim roof pillars, outward visibility in the Fusion is excellent. The 2017 Fusion gets a much better infotainment system; a nicely-equipped sedan can be outfitted for under $30,000. Ford expanded the Fusion lineup for 2017. The standard and Hybrid models are offered in S, SE, Titanium, and new Platinum trim levels. The new Sport is added as the performance option. The Energi is offered only in SE, Titanium, and Platinum trim levels. The base Fusion S is priced higher than the entry versions of some rival models, but at least it is fairly well equipped. It comes standard with cloth seats; a tilt/telescoping steering wheel; cruise control; steering-wheel controls for audio and phone; power windows, locks, and mirrors; a four-speaker CD audio system with a 4.2-inch center screen; SYNC communication and entertainment system with voice control and Bluetooth audio streaming; a USB port; an auxiliary jack; a rearview camera; a capless fuel filler; and 16-inch alloy wheels. New this year is keyless ignition. The Fusion SE adds standard satellite radio, two more speakers, a 10-way power driver's seat and six-way power front passenger seat, a 4.2-inch instrument panel display, a rear center armrest, LED signature lighting, and 17-inch wheels. You can option up to the 2.0-liter turbocharged inline-4 or the 1.5-liter EcoBoost inline-4. 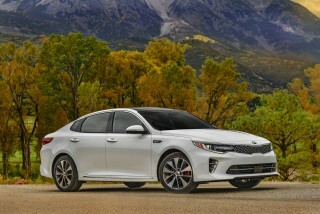 Other options on the SE include upgraded 18-inch wheels, a spoiler, a sunroof, memory seats, front heated seats, a heated steering wheel, premium cloth or leather upholstery, a navigation system, remote starting, fog lamps, Sync 3, dual-zone automatic climate control, automatic high beams, a heated steering wheel rain-sensing wipers, reverse parking sensors, active park assist, and safety tech like blind-spot monitors with rear cross-traffic alerts, lane-departure warnings, and active lane control. The Sport is outfitted like the SE, but it adds all-wheel drive, electronically controlled active dampers, 19-inch wheels, steering wheel shift paddles, LED headlights and fog lamps, a rear spoiler, aluminum pedals, leather and synthetic suede sport seats, a six-way power front passenger seat, active noise cancellation, interior trim upgrades to the dash and doors, and a nine-speaker audio system. The former top model, the Fusion Titanium, comes with the 2.0-liter turbo-4 standard and a choice of front- or all-wheel drive. It adds dual-zone automatic climate control, heated front sport seats, leather upholstery, rear parking sensors, a rearview camera, a 12-speaker Sony audio system with HD radio, the Sync 3 infotainment system with an 8.0-inch touchscreen, ambient lighting, an auto-dimming rearview mirror, aluminum interior trim, remote starting, LED headlights and fog lamps, and 18-inch wheels. To the Titanium you can add 19-inch wheels, a navigation system, enhanced Active Park Assist, adaptive cruise control with stop and go, forward collision warning with brake support, and inflatable rear seat belts. The new Platinum model comes with automatic high beams, a sunroof, a universal garage door opener, cooled front seats, a heated steering wheel, a leather-wrapped instrument panel, a 110-volt power outlet, a navigation system, Sync Connect, a power tilt/telescoping steering wheel, premium floor mats, premium leather upholstery on the seats and armrests, a Venetian leather-wrapped steering wheel, 19-inch wheels, and all of the safety features mentioned above. It also gets pre-collision assist with pedestrian detection. We think the Fusion is at its best value in SE trim, where you can end up with a reasonably well-equipped model for around $30,000. The Ford Fusion is among the more efficient mid-size sedans. The 2017 Ford Fusion remains one of the more efficient cars in its class. However, the Fusion gets slightly lower fuel economy ratings this year due to the EPA's new calculations for fuel economy. A 2.5-liter 4-cylinder engine is the base powerplant for the Fusion S and SE. 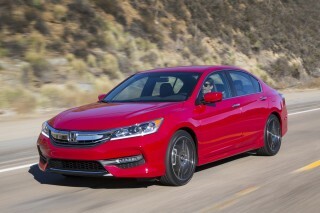 It's paired with a 6-speed automatic, and generates fuel economy figures of 21 mpg city, 32 highway, 25 combined. That's down from 22/34/26 mpg last year. You'll probably do quite a bit better in real-world driving with the 1.5-liter turbo-4, which is also paired with an automatic. Gas mileage is rated at 23/34/27 mpg, down from 25/37/29 mpg last year. This despite its new transmission warm-up feature that uses the engine coolant to warm up the transmission to make it more efficient. Automatic stop-start is also standard with the turbo-4, rather than optional this year. A 2.0-liter turbocharged inline-4 with direct injection is standard on the Titanium and Platinum. It's the performance option of the lineup, but hardly thirsty. Teamed to a 6-speed automatic and front-wheel drive, it earns 21/31/25 mpg, down from 22/33/26 mpg last year. 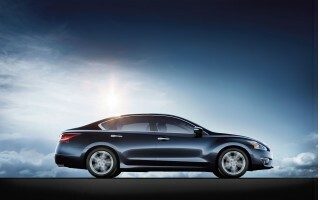 Opt for all-wheel drive and those numbers fall to 20/29/23 mpg. The 2.0-liter turbo also gets the transmission warm-up system, and both the 1.5 and 2.0-liter turbo engines continue with active grille shutters that close at speed to improve aerodynamics. 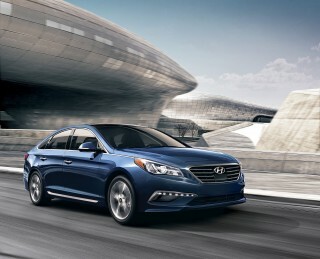 Fuel economy figures are 17/26/20 mpg for the twin-turbocharged 2.7-liter V-6 in the Sport model. 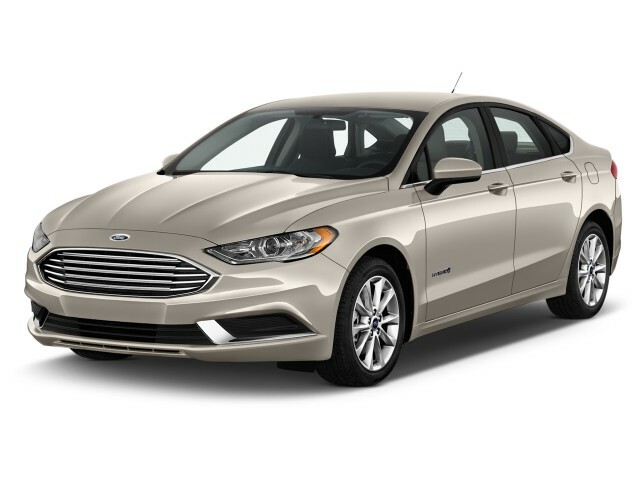 For those who make fuel economy a top priority, Ford also offers the Fusion Hybrid and plug-in Energi models.